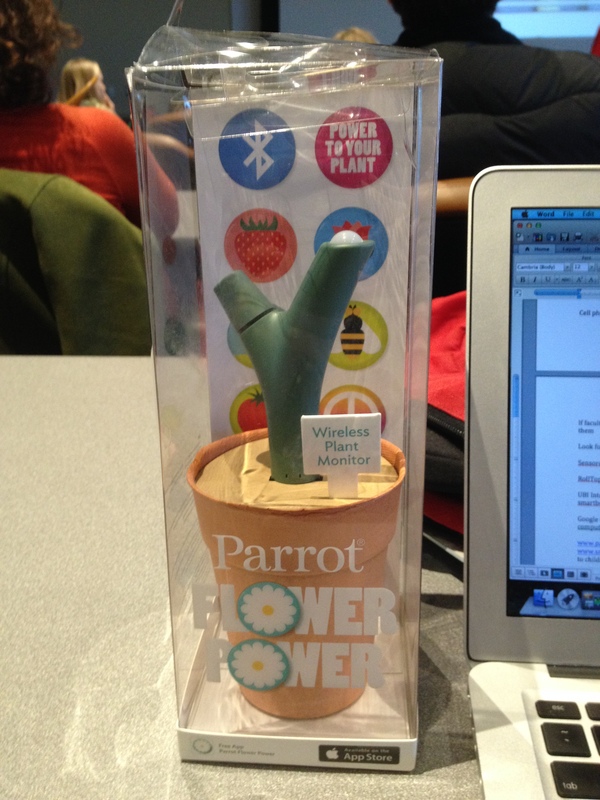 Conference program and name badge. I really appreciate how small and “green” the program is – with the use of sched.org, every conference attendees has the entire program in their hands! 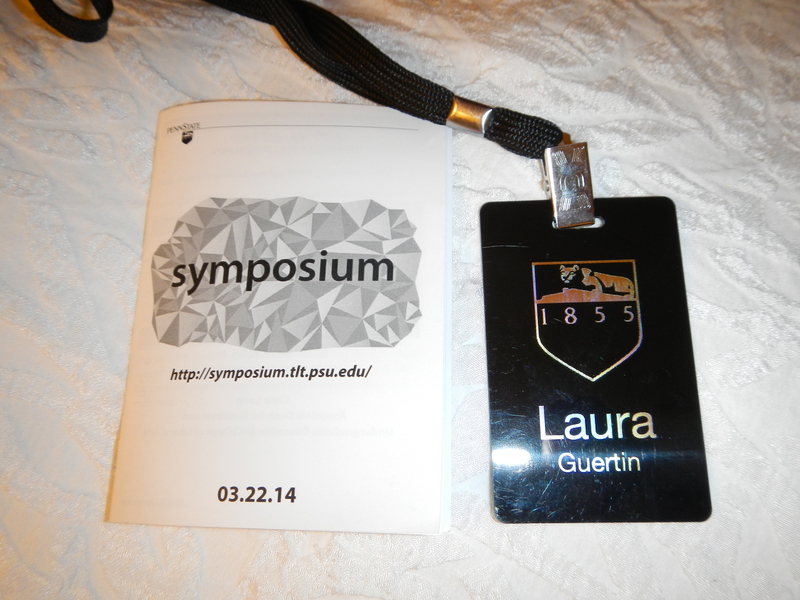 The afternoon of the 2014 TLT Symposium had two Concurrent Sessions and a final afternoon keynote. The first afternoon session I attended was titled Online Social Communities as Research Communities (see elevator pitch). The session focused on using Scoop.it! to help students use this online tool for creating a research community and to collect appropriate research sources. The speaker has established a Scoop,it! page for his class, where students post (I think, or he posts for them) articles and he comments on the appropriateness of the source and words of caution in using the source. I have played a little with Scoop.it! before, as I’m always looking for ways to collect current event articles for students to review to increase what one of my colleagues calls “current event literacy.” Unfortunately, I’m not sure if I got the information I was looking for in this session – meaning, is this really an effective tech tool to increase student learning? or collaboration? or sense of community? I think I need to dig in to Scoop.it! some more, but in the meantime, I’ve been posting water-related articles on the @PSUBW_Water Twitter account so students can find one place with articles that I have vetted and approve of the content. My final Concurrent Session for the day was on Using QR Codes to Reach Beyond the Classroom (see elevator pitch). I supervised a project a couple of years ago where a student used QR codes to help Tyler Arboretum with their annual plant sale, and I’m always curious to hear about additional uses and applications of QR codes. A KINES faculty member presented how she had students create videos on how to properly use the equipment in the weight room at her campus, and then put QR codes on the equipment that students, staff, and faculty could scan to learn how to work out correctly. Genius! All of us in the room started scanning her QR codes to see what the students created – and did I mention that the students filmed and edited the videos all on iPads? Check out the video for Low Row as an example! The room then broke into a chorus of suggestions for how QR codes tied to YouTube videos could be used, such as helping students using lab or field equipment. This session certainly has me thinking about how I can use QR codes w/videos in some innovative ways, especially since I want to get my own students out in the field more in the upcoming academic year. People in emerging countries are able to use crank power to charge their mobile devices to download apps they can use offline. The Pope has an app, and you can confess your sins online through the Confession Booth app and say The Rosary (so if the Pope can figure out how to effectively use technology, why can’t educators?). The Cleveland Museum of Art has figured out how to engage their audiences with their Gallery One technology wall. The Rolltop Portable Computer is coming. Kids pajamas can now be scanned with a mobile device and will start reading a bedtime story to a child. Sesame Street has even created a song/video called There’s An App for That. 90% of students have a mobile device. Cell phones all have features that can be used for education. An app is nothing but content – it can HELP us teach and learn (it is up to faculty to adapt it to use it for teaching and learning). It is up to us educators – anything that can help a child learn, we need to go for it. The slides from Dr. Melton’s presentation are available online at SlideShare and worth going through – or, you can jump right in and watch the video recording of her presentation. I know I will review them again, as I need to keep telling myself that students are going to be bringing mobile technology to the classroom, no matter what – so how can I make sure students use the mobile technology for what I want them to use it for (something course related), instead of spending time on social media and doing other tasks that are not part of the course? Amazing news! This year’s #tltsym14 attendance was 490, which is a 44 percent increase over last year! Thank you to everyone who came out!